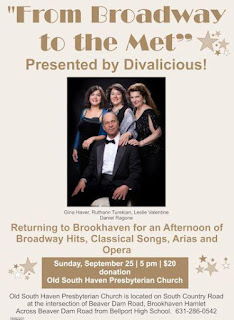 program of opera and Broadway musicals: John for designing and printing the programs; Kappy, Deb, Darcy. thankful Old South Haven can offer this kind of program for the larger community. "Generosity Rising: Lead a Stewardship Revolution"
Sermon: "In the Face of Not Knowing"
Sermon: "Living in the Land of the Unfamiliar"
Sermon: ",,,I bought the field..."
5:00pm "From Broadway to the Met"
"Generosity Rising; Leading a Stewardship Revolution"
Sermon: ":Living in the Land of the Unfamiliar"
Sermon: "The Anguish of the Prophet"
Sermon: "...I bought the field..."